Everybody has seen the pictures: In front of the singer, what appears to be the wrong end of a megaphone; behind, an upright piano on a platform, or a motley group of instruments that looks like about ten percent of an orchestra stuffed into a large broom-closet. The miracle of recording, in its earliest phases, was a cramped and somewhat undignified affair. Only three or four minutes could be recorded at a time, so pieces had to be chosen carefully, or abbreviated, or rushed. Whatever wasn’t directly in front of the horn had to be very loud to be captured at all; they shaved the felts on the pianos to make them more strident, built special violins out of metal so their sound could “cut,” replaced cellos with trombones, etc. On the other hand the singer close to the horn could not be too loud, or the result would be captured as blasting noise, so they had to think constantly about turning to the side for the most powerful notes. The pianist had to bang, or the band had to blare, but the soloist had to learn to ignore this so as not to shout in response. Nothing could be edited, so each “take” had to be accepted or rejected in its entirety. And even if, against all odds, the singer managed to perform with confidence and expression, only a restricted portion of the sound audible in natural space would be registered by the machine. 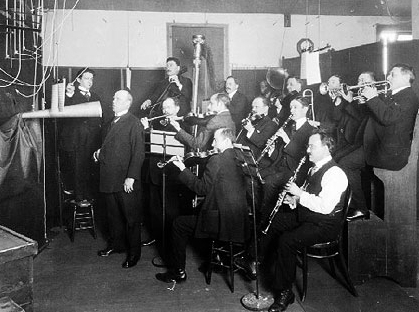 This was the world of “acoustical” recording, and it lasted up to 1925. In effect, about a quarter century; although Edison invented recording in 1877, the commercial industry didn’t blossom until about 1899-1901. But that quarter-century contains all we have from Caruso, Tetrazzini, Sembrich, Calvé, De Lucia, Battistini, and many other stars of the day. It also contains all we have of singers who worked directly with Verdi, Wagner, Gounod, Tchaikovsky, Dvorak and a long list of their fellow composers. Most important of all: it preserves two whole generations of singers who never heard a microphone singer, never saw a “talking” movie, never imagined the human voice used any other way than with its own natural projection. What we call “classical” music is basically the only remaining form of public vocal activity, spoken or sung, that we try to accomplish naturally. Back then, singers and actors in all styles, along with preachers, professors, generals, and politicians did their own versions of the same thing. So opera at the beginning of the 21st century has a lot to learn from the people who learned how to sing in the 19th or early 20th. Before we can learn from the singers, though, we have to learn how to hear them - because it’s hard, at first, to focus on the details when the overall sound-picture is so strange. Here’s a clip that can help jump-start the process, stitched together in alternating phrases from Rosa Ponselle’s recordings of “O patria mia” in 1923 (acoustic) and 1926 (electric). Same singer, same music, same conductor, same recording studio, in digital transfers by the same amazing restoration specialist (Ward Marston - have a look at marstonrecords.com). What’s the difference? Mainly, overtones - both those of the voice itself, and those of ambient sound and bass-register orchestral notes in the room. The flexible material inside a microphone could be set quivering with far less physical force, and therefore could respond to quieter and more distant soundwaves - more like the human ear. At first Ponselle almost sounds like two different singers. But if you listen even a few times you can start to hear the similarities outweighing the differences, and in that way you can install a kind of mental translation software to help with the voices that made only acoustical recordings. Here’s a fragment with one of those voices: Giuseppe Campanari (1855-1927) singing a few seconds from the Toreador Song in 1898, 1905 and 1909 (in Italian). This gives an idea of how much progress was made even within the pre-microphone period. In general, the earlier the record, the more mental translation we have to apply to imagine the lost frequencies. Getting familiar with enough examples like these does the trick for almost all listeners who are operatically inclined in the first place. It just takes a little time and curiosity. The constant mental note to be taken when hearing “acoustics,” remembering Ponselle’s Aida: probably a bigger voice than you might first think; probably richer and sweeter, probably less “pointed” or seemingly “nasal.” Meanwhile the basic facts of the singing - vibrato, registration, legato, phrasing, etc. - are faithfully reported even when the timbre or color of the voice is not. And even when the singer may have been performing in a somewhat compromised fashion under the circumstances. Making the effort is really worthwhile, especially for singers themselves. We'll hear sounds made by people whose only possible concept was sound that could function acoustically - and that is what we still try to create when we sing opera without mikes in real life. No soft note that wasn’t rich in overtones and body was useful. Strength had to be distributed all through the range, not just its upper part. Notes had to be physically bound to one another without gaps or dropouts of energy to make what we call legato lines. And as a bonus, we get some echo of the musical flavor of opera in its late heyday. A lot of things were done differently! Some of those differences would not win favor today - or at least, not with everyone. But knowing about them is food for thought and possible inspiration. A great many of the “rules and regs” we follow today were invented well after Verdi, Wagner, Puccini, and Strauss had departed the scene. There’s every reason to hold those rules up to occasional scrutiny, and to ask what purpose they serve. Teatro Nuovo presents a selected acoustical recording every Tuesday as “Will’s Record of the Week,” with brief notes by our Artistic Director to give some context. Check them out here and enjoy!